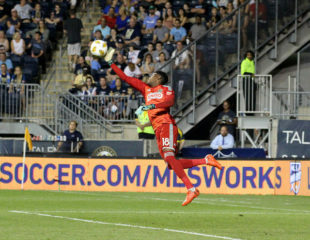 We’ve talked a lot about what Marco Fabian means for the Union, but Jonathan Tannenwald asked what the Union means for Fabian. In an open letter, Marco Fabian spent a lot of time talking about championships. Is Jay Sugarman just signalling that this is the beginning of a new era, or is there even more to come before this season starts? Bethlehem Steel FC started this preseason game off right, scoring three in the first half to beat FC Motown 3-0. Easily the most controversial statement of Andre Blake’s career. Trades are a normal part of professional sports, but Kei Kamara’s odyssey has been particularly circuitous. Okay I can grant that SKC have something special in their stadium, but is the competition really that tight for “top tourist attraction in Kansas“. Columbus’ new kit is perfectly familiar, even though it’s a result of Anthony Precourt’s negligence of the team. Darlington Nagbe yearns for Ohio. Obviously they’ve got a bell of their own, but does anyone else feel like Montreal is moving in on Philly’s territory with that jock tag. That’s going to be kind of weird when Inter Miami comes to California. Minnesota has revealed their new plain white secondary kit, which some fans are referring to as “Fruit of the Loon“. Former USMNT player and FC Dallas Technical Director Fernando Clavijo passed away Friday after a five year battle with myeloma. The biggest change that Gregg Berhalter has brought to the USMNT is a willingness to communicate. A beautiful assist from McKennie helps Schalke tie Bayern. Mexico released their roster for an upcoming camp. Jonathan Gonzalez is not on the list. Christian Pulisic inspired Jadon Sancho to leave England and join Dortmund. Tragedy struck Brazil (again) as ten people died in a fire at Flamengo’s youth training center. Ole Gunnar Solskjaer: miracle worker. Positive spin: Everton isn’t the problem. Pineapple & olive is where it’s at. Any pictures from Friday night? the only news that matters today. children die.